Following last Thursday's First Update, I'm pleased to report at least one vehicle has escaped from the workshops with Volvo B7 32206 LT52WTM back on the road. Enviro400 33824 YX63LKO and Dart 42929 SN05EAJ remain. My thanks to First for the information. An East Lancs bodied Diamler CVG6 paid a visit to the East Anglia Transport Museum yesterday. Former Huddersfield Corporation HVH472D has been visiting various places of interest on its way from West Yorkshire to attend this Saturday's North Norfolk's Vintage Bus Rally. Following a quick shopping trip to Great Yarmouth during late yesterday afternoon, I visited the usual places to see what was about. One vehicle that did stand out was Golden Boy Coaches' new black liveried Irizar bodied XO18BOY. The Hoddeston, Hertfordshire based company is celebrating its 50th Anniversary this year. Local operator Dolphin Executive Travel's Mercedes Benz O1220L KEN54 was awaiting passengers on North Drive. New to the operator in March 2000 it was previously registered W997YFL. 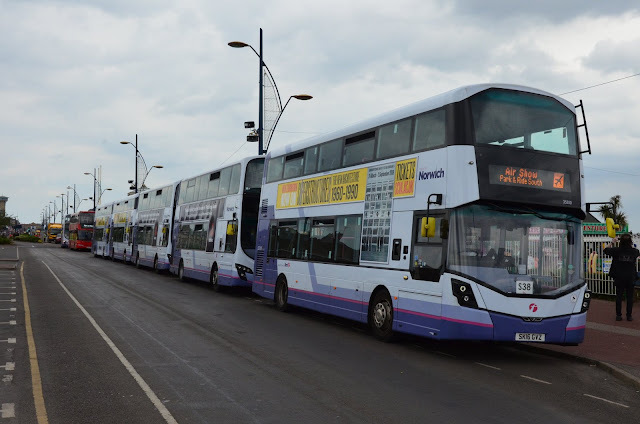 Finally, the latest news from First Great Yarmouth is that both ADL Enviro 33824 (YX63LKO) and Dart 42929 (SN05EAJ) are both off the road with starter motor problems. As you may recall from recent posts celebrated Film director Danny Boyle is currently shooting his next film in the Norfolk & Suffolk region with filming taking place today at Gorleston Beach. 5000 extras have been required for the scenes being filmed today so a special Park & Ride service has been set up by First to ferry the extras to and from the location. Beacon Park which was recently used for the Airshow was again in use for parking. 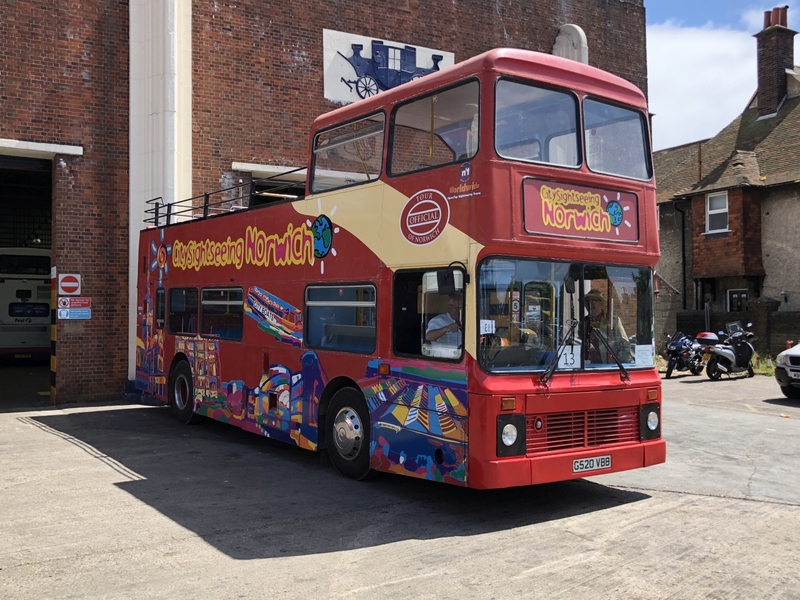 Loaned in for the day is Awaydays Open Top Olympian G520VBB which wears City Sightseeing colours for the Norwich Tour, it now acts as a spare vehicle for the service. It is seen above about to head into service outside Caister Road this morning. Many Thanks to Will Drake for the Photo. Applications relevant to this area include two services operated by Our Bus. They are the 100 between Hemsby Beach and Great Yarmouth's Market Gates plus the 200 from Vauxhall Holiday Park to the Pleasure Beach via Market Gates. Both are Monday to Friday services commencing from 25th July 2018. In February, Shearings Holidays announced that it was adding another thirty new Mercedes Benz Tourismo coaches to its fleet under its ongoing vehicle renewal programme. Each coach will be individually named after loyal customers and drivers, both past and present, in celebration of their life and loyalty to Shearings. They include new features, such as lateral seat movement, WiFi and USB charging points. The rest of the fleet will also have WiFi installed prior to the summer season. 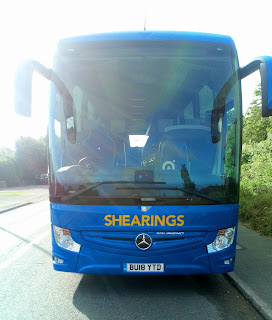 Shearings Holidays has a fleet totalling 130 with none of them more than seven years old. You may already be aware that there was an accident involving one of First Eastern Counties ADL Enviro400s on the A47 in Cambridgeshire early this morning. Unfortunately, as a result, two people have lost their lives and there were also injuries to several others. One of the fatalities was the Kings Lynn based bus driver and our thoughts and prayers go to his family, friends and colleagues. He was later named as Michael Elcombe and was previously a First Great Yarmouth driver for a number of years. Our similar thoughts go to the other deceased person's family and friends too. Continuing the Lowestoft theme, the local Suffolk Norse operation has had one of their Ipswich based vehicles on loan for at least the last ten days. Our regular Lowestoft reporter Simon Bartram noted Alexander Dennis Enviro300 SN06BOV at Gordon Road yesterday. It was about to work the 14:06 service 108 to the Suffolk village of Lound. My thanks to Simon for the information and photo. 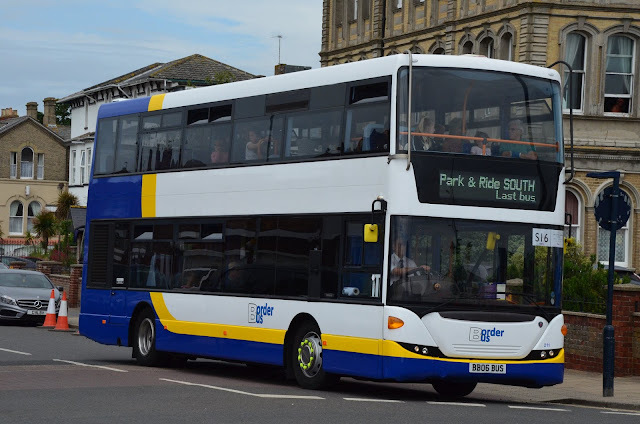 Lowestoft based Dart 42938 WX05SVD has returned from Simon Morris after being repainted and is now carrying a Dark Blue based livery advertising First's new M Ticket App where you can download your tickets online and not worry about having cash ready for your Bus Travel. It was out for the first time this morning working the 101 service between Carlton and Gunton. Thanks to Andy Swan for the photographs. 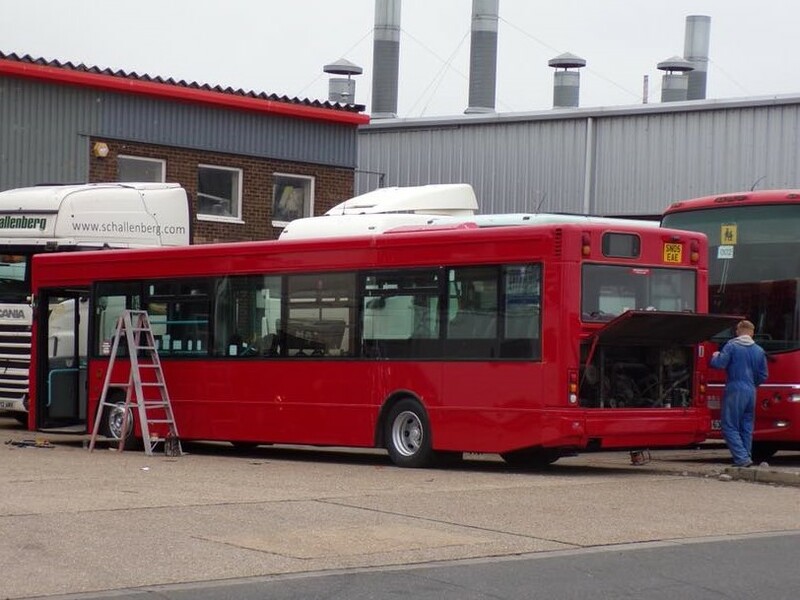 The latest news from First Great Yarmouth's Caister Road depot is that, following the completion of the Lowestoft saloon repaints, Dennis Dart SLF 42943 WA06OAS has headed for Simon Morris for its own repaint. Thought to be for a heritage livery, this will complete all the Dart repaints at Great Yarmouth. Meanwhile, to make up for the shortfall 42921 EU05AUN has returned from its loan at Lowestoft. 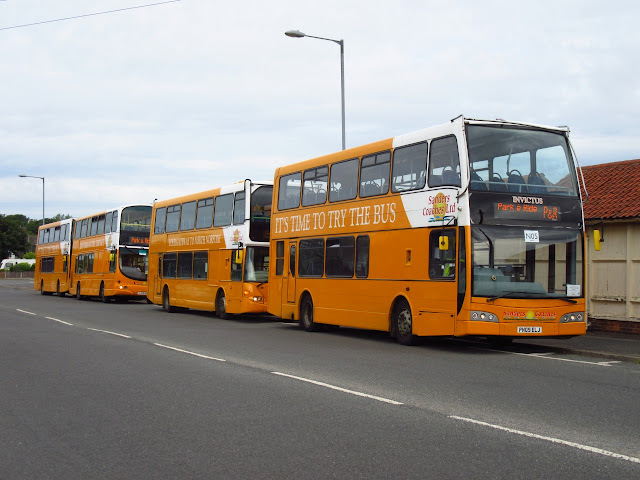 Regarding the local decker fleet, 36186 BN12JYJ is awaiting a new gearbox, which should be fitted this week, and Volvo B7TL/President 32206 is also off the road awaiting repair. Following the completion of damage repairs at Full Circle, First Norwich Gemini 36167 BD11CFM is now at Caister Road for its MOT. It had been off the road since February. Buckland Bus Company of Rendlesham near Woodbridge has registered a new service and a cancellation. The former is the 250 service between Rendlesham and Thorpeness, via Snape and Aldeburgh, which will operate on Wednesdays, Sundays and Bank Holidays only This replaces the cancelled 250 between Fort Green, Aldeburgh and Thorpeness from 25th July 2018. Two Norfolk companies have cancelled their operating licences; the first being Craske Coaches of Laxfield Road at Catfield in Sutton. The loss of a Stalham school contract last year, which it had operated for 16 years was clearly a blow to the company. It then decided to downsize with the Yutong YC15WDJ working for David Urquhart out of its Norfolk base, whilst the Berkoff, YN06NZV, was located in Essex operating from there. The cancellation suggests that the arrangement didn't work. Whilst wife and daughter wanted to spend most of the day shopping in Worthing last Wednesday, it was suggested I should go to Brighton on the 'Old Gits' bus pass. So armed with my lunch, camera and phone I boarded one of the new Alexander Dennis Enviro400MMCs heading for Brighton on the 700 Coastliner just after midday. This gave me the ideal opportunity to assess how good they were in service.The ride seemed to be quite smooth with the lovely blue seats feeling very comfortable. WiFi was very good although, on the return journey, I rued the fact that I hadn't taken my charging lead me to take advantage of the USB connection! I was pleased that there were no 'the next stop is ..' announcements to be heard which are quite common on the Brighton & Hove buses. However, it must be very irritating for the driver as the engine stops every time the door opens. I can understand the safety issue and the fuel saving element but it must put a lot of strain on the starter motor. The driver I spoke to said it was very annoying! It didn't take too long before we arrived at Churchill Square where the first non Brighton & Hove bus, among the sea of red and cream, was The Big Lemon's Dennis Dart KN52NFV. This well travelled bus was new to Tellings-Golden Miller and has seen use with Travel London, Travel Surrey, Abellio Surrey and Acme Transport Services of Essex. I then adjourned to Stein Gardens and within half an hour I saw both former Konectbus Mercedes Benz Citaro articulated buses terminate there following their use on the Universities 25 route. BL57OXM was in the Brighton standard colours scheme, but branded for the 25, whilst BL57OXM had received a 'Love Music Love Brighton' livery. One of the reasons I was determined to get to the City was that I saw on a Facebook group that Brighton & Hove were trialling a hybrid electric Wright Streetdeck. My first attempt in getting a picture of SK18TKX was photo bombed by a motor cyclist!! However, my second attempt was much more successful. Pleased with my haul, I looked in at the nearby Pool Valley Coach Station to see what was on offer there prior my return journey. On site were two Caetano Levante bodied Volvo B9Rs in the form of West Midland Travel's FJ11GLZ and FJ12FYH. 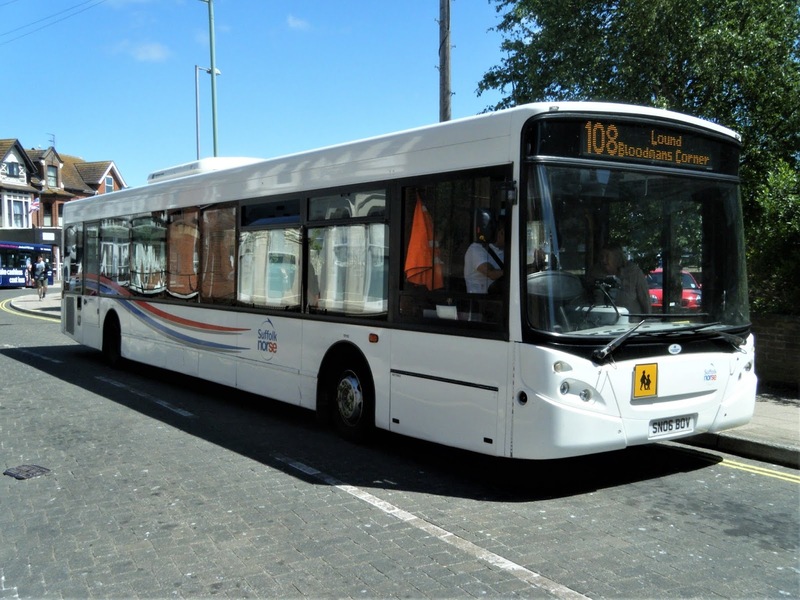 The third coach present was Luckett's new Volvo B11R BU18OSX. It was only month old having been delivered in mid May. Firstly, my thanks to Grahame for looking after the shop whilst I spent a week down in Worthing, West Sussex. This post contains just the highlights of my observations there and the remainder of the photos taken will soon be available to view on the Eastnorfolkbus Flickr site. The main change since our last visit is the introduction of thirty 2018 registered Alexander Dennis Enviro400MMCs operating the 700 Coastliner service. These have replaced the Scania 400s previously operating the route, some of which have moved to the north west of England. A couple of unusual workings saw double deckers undertake work on Worthing local services normally operated by saloons. Coastliner branded Scania N230UD/Alexander Dennis Enviro400 15993 YN64XSX was employed on the Durrington Tesco service on 9th June although their appearance on the 10 appears more often now. What was a complete surprise, however, was the use of 10970 SN18KPE on the Pulse route, normally exclusively provided by the specially route branded ADL Enviro 200s. Another area of interest was schools workings and recent Compass Bus acquisition Alexander Dennis Enviro 400 BX11PTO was seen on Marine Parade.It was formerly a demonstrator as a Euro 6 development vehicle and is fitted with a larger Cummins euro 6 engine. The Lancing depot of Crawley Luxury Coaches at around 4pm on school days is a good place to see a procession of school workings returning home and it is unbelievable that so many coaches can be accommodated on this site surrounding the workshop. Finally on the Friday BBC Local Radio were utilising their PO56JFV, an East Lancs Myllenium bodied MAN 14.220, in Montague Place in Worthing Town Centre for publicity purposes. 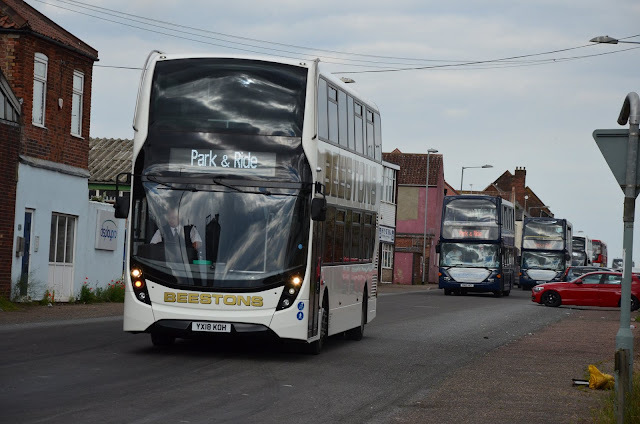 The two Dennis Trident/Plaxton Presidents, which had been languishing in the rear yard of First Great Yarmouth's Caister Road depot for a couple of months, finally left the town on Friday. Both 32801/49 (T801/49LLC) were seen heading out of Great Yarmouth on the A47 towards Norwich later that day. They were part of a trio arriving at Norwich from First South West during October last year and they subsequently moved on to Great Yarmouth. The other one, 32809 (T809LLC), returned to Norwich for use as a driver trainer in April whilst 32801/49 remained out of service. They have now been sold by First to unknown buyers, although I understand both were observed parked up in Lincoln yesterday. Photos from the two days of Park and Ride operations from the Airshow. Great Yarmouth will be hosting its first Airshow this weekend with thousands people expected to visit the seaside town over the two days. As a result two Park and Ride services will operate to help move the crowds. This site is based at Beacon Park in Gorleston near to the James Paget Hospital. It will be operated by the following companies. This site will be based at Great Yarmouth Racecourse and will be run by the following companies. First will continue to operate normal services with additional X1/X11 services between Lowestoft/Great Yarmouth & Norwich. The Seafront 3 Service will be running with an every 20 minute service between Haven Seashore Camp and Britannia Pier. Delays are expected on all services during the weekend but please be aware as many services as possible will be available to move people around the area. Many Thanks to Chris Speed at First for the information. 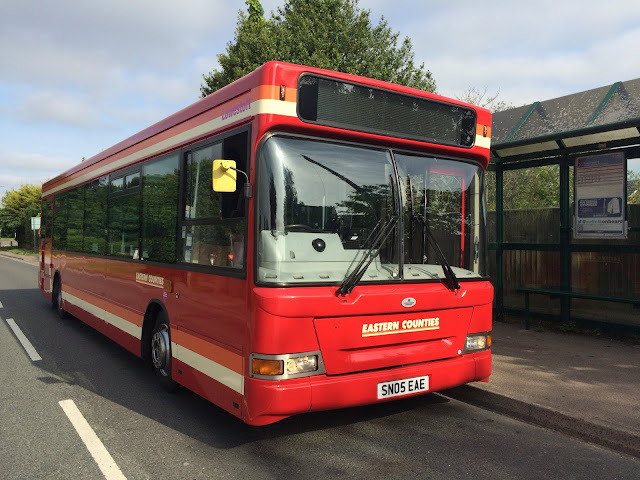 Today saw another Heritage livery for Eastern Counties hit the road in Lowestoft. Joining Lowestoft Corporation liveried 30888 is Dart 42926 SN05EAE which is now shopped out in Post Office Red of Eastern Counties with Cream and Orange Trim. Three vehicles now proudly wear these colours with 32479 at Ipswich and 60916 at Norwich the other two. This brings the total number of heritage liveried vehicles in the fleet to Six with possibly more expected if management have their way! 42926 was back at work on the 99 service between Lowestoft and Southwold today. Many Thanks to Lee Page for the photo. An enquiry of the Government's Vehicle Operating Licensing website on Tuesday revealed some changes to First Great Yarmouth bus services over the weekend of 16th and 17th June in connection with the Airshow. 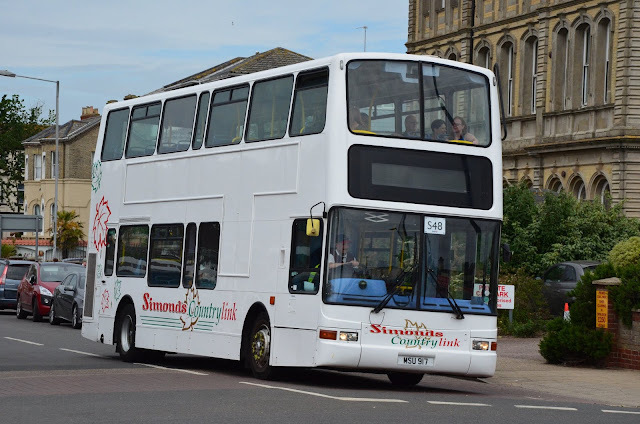 There is to be a more intensive service on the X1/X11 service between Norwich and Great Yarmouth and similarly the 3 between Seashore Holiday Village and South Beach Parade over the two days. The loanee was 42921 (EU05AUN) and it was primarily being employed on town service 101 between Gunton and Carlton Colville via the bus station. After many months of speculation, Norfolk's oldest coach operator is to close next month after more than 100 years in business. 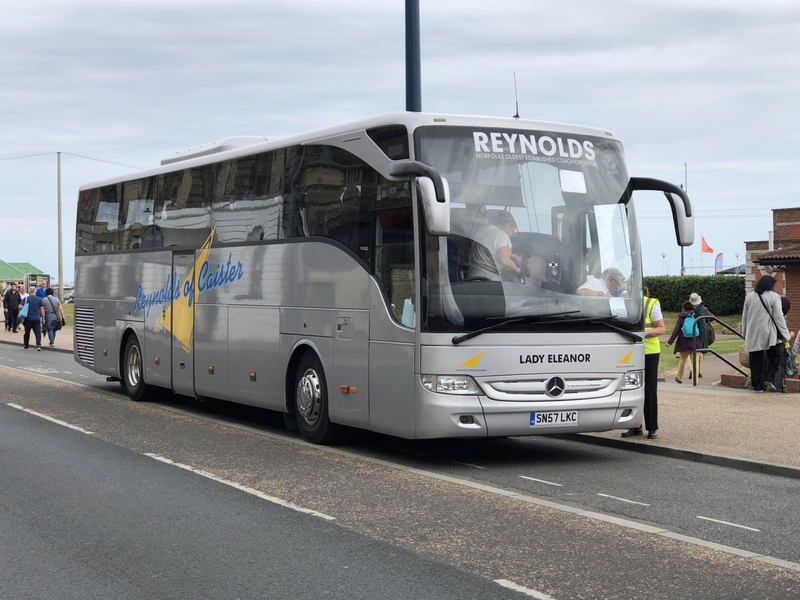 Owner Charles Reynolds has taken the decision to cease operating Reynolds Coaches following ill health and there is no successor to take it over. He can no longer devote the 80 to 90 hours a week he spends on running the company. The company was established by Mr Reynolds’ grandfather, a builder and haulier, who started it off with horses and carts. During the Second World War it reduced to virtually nothing but his parents subsequently resurrected the business. Reynolds Coaches employs a staff of 24 looking after its fleet of 20 coaches, all named after family members or specially nominated VIPs. The operator has been ferrying children to and from school for decades and will continue to honour all of its 14 Norfolk County Council contracts until the end of July. An auction of coaches is likely to take place at the firm's Caister site during August. 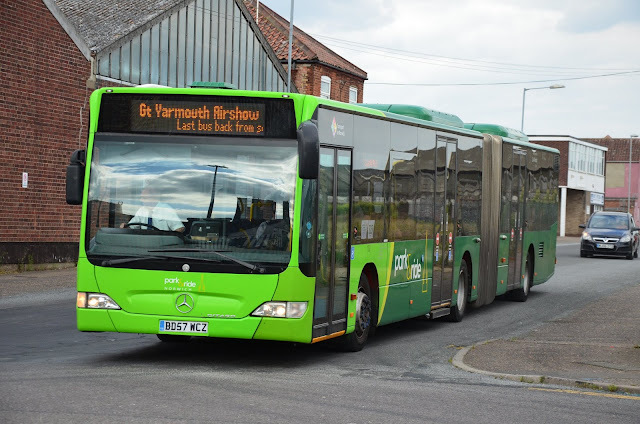 The other movement to report is that Alexander ALX400 bodied Volvo B7TL 30959 (YJ51RCO) was expected to go to Norwich overnight following yesterday's stint on a Bernard Matthews contract. This leaves 39054/64 (YJ51RDO/RAU) of the original five still at Caister Road requiring some work to be undertaken before they can enter service. Two deckers were observed on this afternoon's Bernard Matthews' contract working with ex First Manchester ALX400 bodied Volvo B7TL 30959 (YJ51RCO) leading the way. Following closely behind was similar 32062 (W422SRP) which was previously with First Leicester. Two of the former five Oldham based buses have now transferred to Norwich to undertake similar contract work for the same company. The twosome are 30960/1 (YJ51RDU/V). Last Sunday you may have been out and about on the streets of Norwich and have had to do a double take when seeing a former Hong Kong bus pass by. The buses passed to New World First Bus with the Hong Kong Island route franchise from 1st September 1998 and DM17 saw its withdrawal in August 2002. Three enthusiasts acquired it for preservation in December that year followed by a lengthy process to transport it to the UK in 2003. After some detailed work at a Norfolk site it subsequently appeared at some rallies. Local enthusiast Keith Dickerson has recently acquired it and, after living in the shadows for many years, it was prepared locally for its MOT which it passed. The first run out was last Sunday, 27th May, around Norwich with a few guests including students from Hong Kong studying in this country. It is basically a three axle Dennis Dominator and will hopefully be appearing at events during this summer and carrying enthusiasts on free trips. Many of you will know that Ross Newman, of bus dealers Ensign, provides regular monthly updates of vehicle movements to and from the Purfleet premises. 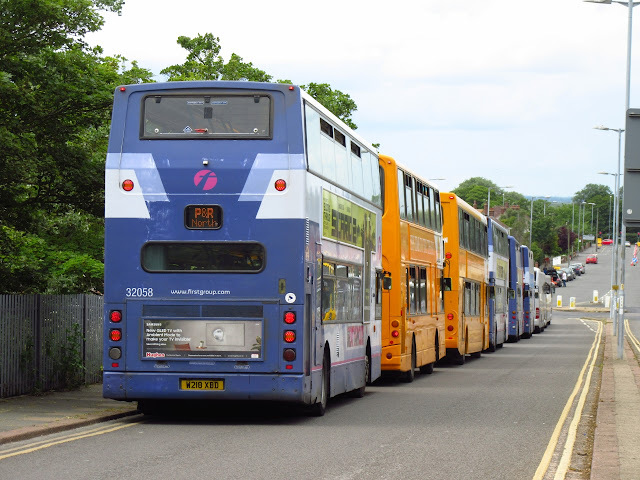 Last month's report (May) contains details of some bus departures of local interest. when Syd Eade took a photo of it in April 2013. The other two buses of interest are Ex Nottingham City Transport Scania N94UDs YN07EYX/Y which are now with Sanders of Holt. The East Lancs bodied OmniDekkas were new to Nottingham in March 2007 as their 759 and 760 respectively. My thanks to Syd for the photo and to Ross for the continuous monthly reports from Ensign. On Monday I reported that First Lowestoft's Dart 42926 SN05EAE was in the Simon Morris workshops at Ipswich for a repaint (Darting to the Paintshops); the bus has now reemerged. However, as Bryan Dickson's photo shows, it has not been repainted in the customary First colours but has received a red (poppy?) livery. It is expected it may get the heritage vehicle treatment and has not been painted for an overall advert.